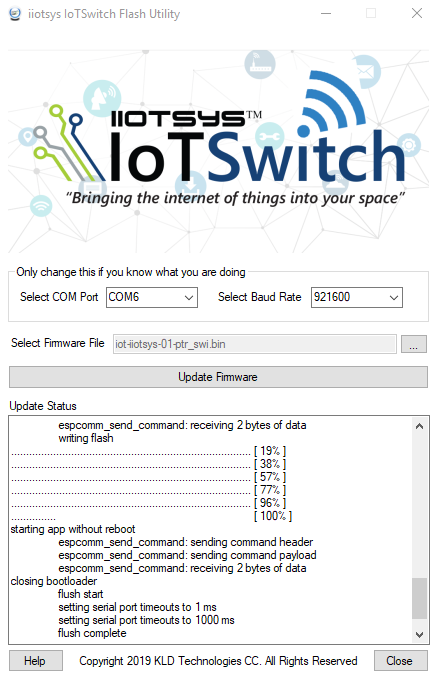 The iiotsys™ IoT Switch firmware can be updated using Over The Air (OTA) firmware updates, these update controls are in the form of buttons marked “update” or “update firmware”, accessible from Mobile App switch details section or through the Web User Interface of the iiotsys™ IoT Switch products. The iiotsys™ IoT Switch firmware can also be physically updated using any generic USB to TTL Serial Module/Adapter. Please refer to the product user manual for connection and programming details. Kindly contact your nearest distributor if assistance is needed for restoring firmware to a damaged or erased controller chip on the iiotsys™ products. If you are a iiotsys™ distributor kindly contact our offices if you have not already downloaded the tools and utilities from the distributor area on our website. If you are a consumer click the download button to download the windows flash utility and firmware for Sonoff support. Windows 10 x32 and x64 bit installer. Unzip and install the flash utility. Please visit our video section for a short tutorial. download, unzip the latest firmware image and product user manual for your model of iiotsys™ IoT Switch or Sonoff device. Follow the manufacturer instructions to load required drivers for your USB to TTL Module/Adapter if required and ensure a COM port is available. Disconnect iiotsys™ IoT Switch from mains, disassemble the iiotsys™ IoT Switch as per the product user manual. Follow the instructions from the product user manual to enter programming mode and ensure the correct USB to TTL Module/Adapter connection as per diagram. Select the COM port assigned by the operating system and a supported baud rate. Browse to and select the *.bin file downloaded in Step 1. Click Update Firmware select OK to proceed or Cancel to exit. Please remain patient, progress indicator will display the progress, firmware update should take no longer than 1 minute. 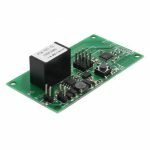 Unplug USB to TTL Module/Adapter, return the jumper to normal operation mode position, assemble iiotsys™ IoT Switch as per product user manual and restore mains power. Open the Mobile Application, long tap the switch that you upgraded, select switch detail and then tap Restore Switch. Congratulations, your iiotsys™ IoTSwitch has been upgraded successfully. Please read the recommendations in the help tab of the utility window. ***For Sonoff devices follow the manufacturers guideline to install the necessary pin headers and place the Sonoff switch in programming mode. Then simply connect the USB to TTL adapter and flash the new firmware using the utility. Unzip contents of zip file. Please visit our video section for a short tutorial. download, unzip the latest firmware image and product user manual for your model of iiotsys™ IoT Switch. Run “update” from a command prompt where the unzipped files are located, enter the COM port assigned by the operating system, a supported baud rate and the path, bin file. Press enter, please remain patient, progress indicator will display the progress, firmware update should take no longer than 1 minute. *** For Sonoff devices follow the manufacturers guideline to install the necessary pin headers and place the Sonoff switch in programming mode. Then simply connect the USB to TTL adapter and flash the new firmware using the utility. iiotsys™ IoT Switch Firmware for single channel in-line and isolated models. iot-iiotsys-01-ptr_swi for use with Mobile App 1.56.13 or higher. Sonoff (Basic) Switch Firmware for single channel in-line models. 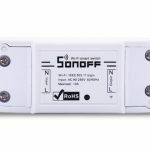 Sonoff (SV) Switch Firmware for single channel in-line models.